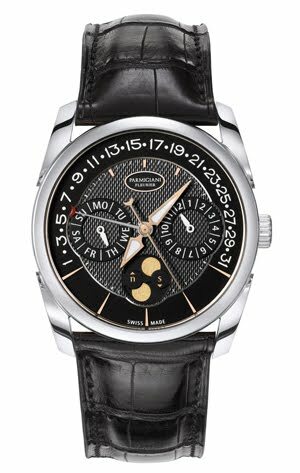 Manufactured in the Parmigiani Fleurier dial production unit, the face of the Tonda Retrograde Annual Calendar can be either silver or charcoal grey and features a delicate grained decoration or a barley grain in the centre and a black or silvered opaline ring. The case is available in rose gold or white gold and is also manufactured at Parmigiani. This new exceptional timepiece is then finished with a Hermès alligator strap.